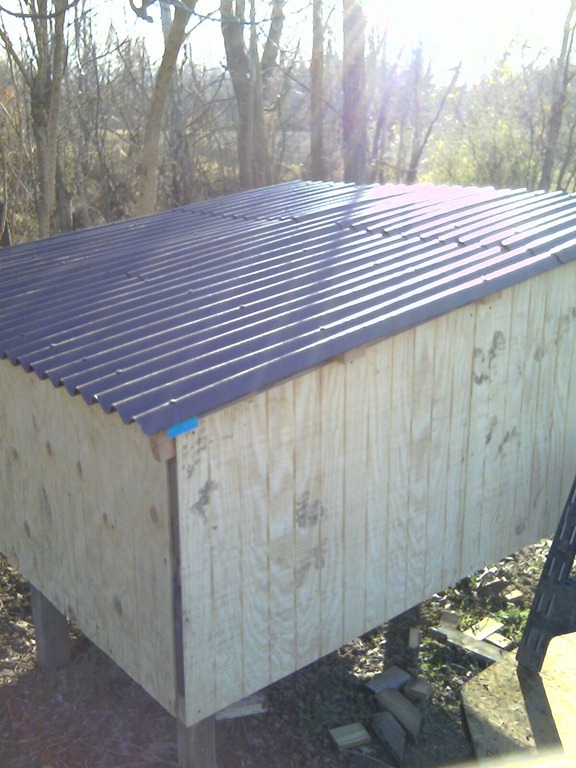 The weather finally gave me a little chance to get out and work on the dog house one afternoon, and it is almost finished. I have the three side walls attached and the roof is on. I still need to put some nails in the very center of the roof where I couldn’t reach from my ladder. I was afraid the panels might crack if I climbed on them to nail the center section. I am going to use a 4X4 sheet of plywood laid on top to distribute my weight and then I can reach the center section. We had 40 MPH winds yesterday and I was worried the panels might come off but everything is still secure. 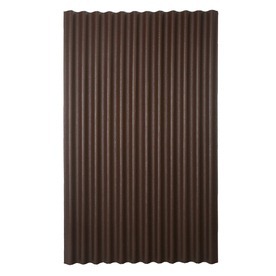 I used these corrugated cellulose fiber/asphalt panels purchased from Lowe’s. The best way I can describe them is tar paper/roofing felt pressed into a fiberglass mat. The panels smell just like roofing felt and you can see the fiber mesh embedded in the panel. The instructions for cutting the panels said to use a skill saw with a carbide blade mounted backwards. Just a tip for you, you can use any blade it doesn’t have to be carbide tipped, and definitely don’t use a new blade. I did and the tar sticking to the blade almost ruined it. I sprayed it down with W-D 40 and scrubbed and scrubbed to clean it off. If I use these panels again I will cut them with an old blade. They are light weight and easy to cut and seem to be fairly sturdy. How they will hold up in the future is yet to be seen, I’ll let you know in a couple of years. I would like to welcome my newest follower Hollis Plample. He has his own blog where he expresses his opinions with his drawn cartoons, check it out if you have time. 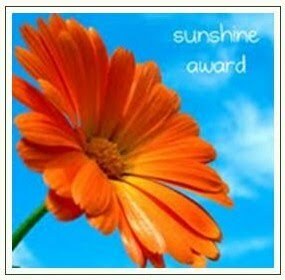 Thanks for hitting that follow button, it is much appreciated! I hope I’m not boring you with my old books, I got excited about them as I rediscovered them as we were moving. 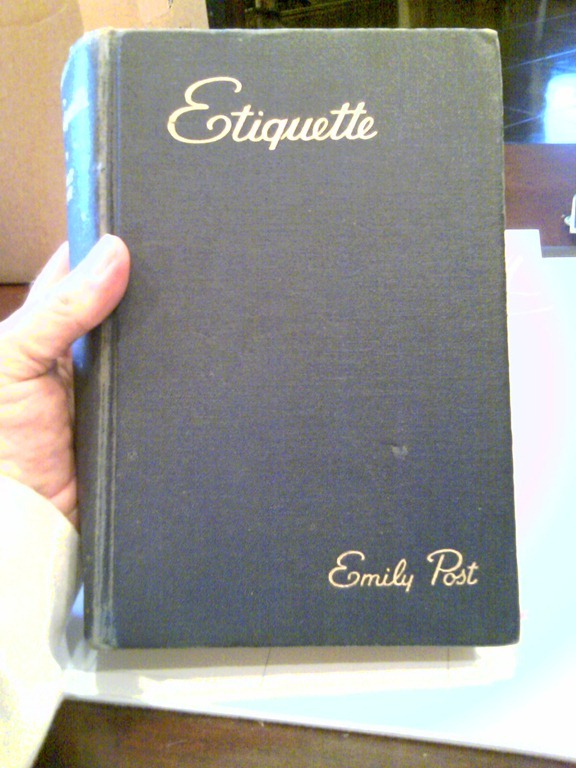 This is a copy of the Etiquette book by Emily Post. If you learn everything in this book you won’t have to suffer through any of those “awkward” social situations, you will always know how to conduct yourself in a proper manner. This book was published in 1940, and I think it has been revised for more modern situations, but if you comport yourself as described in this book I don’t think you can go wrong. 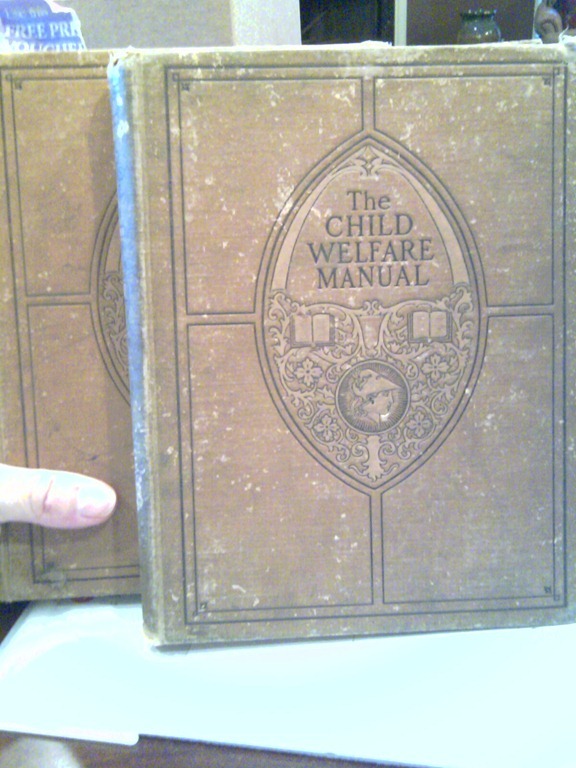 This is a two-volume set of The Child Welfare Manual published in 1915. It contains everything you need to know to properly raise a child both physically and psychologically. Many people would think some of the ideas in this book are old and outdated, but if children were reared more like this book describes our children would be much better off today. 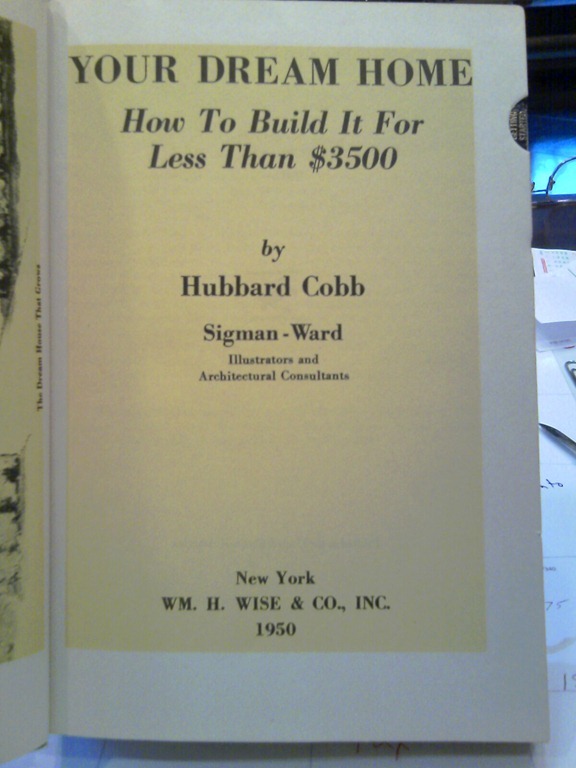 And finally, this book is about how to build your dream home for less than $3500, published in 1950. Obviously this number needs to be updated! 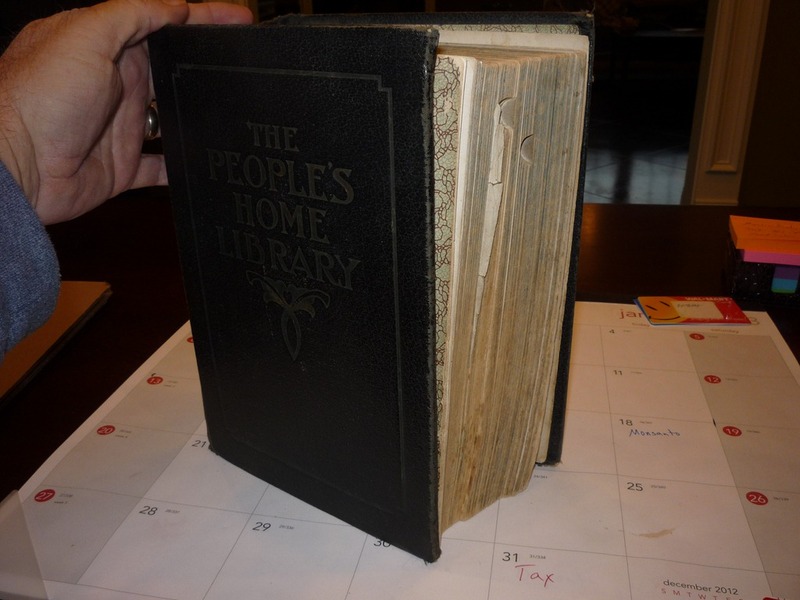 But it is primarily an instruction manual of techniques for actually building a home, and that has not changed that much for the most part. There are some techniques and materials that are outdated such as lath and plaster and cast iron plumbing pipes, but if you find yourself working on a very old structure, you might need some guidance on working with these materials. I also found a newspaper page folded and inserted in this book. This ad was in the St. Petersburg Florida newspaper 1976. 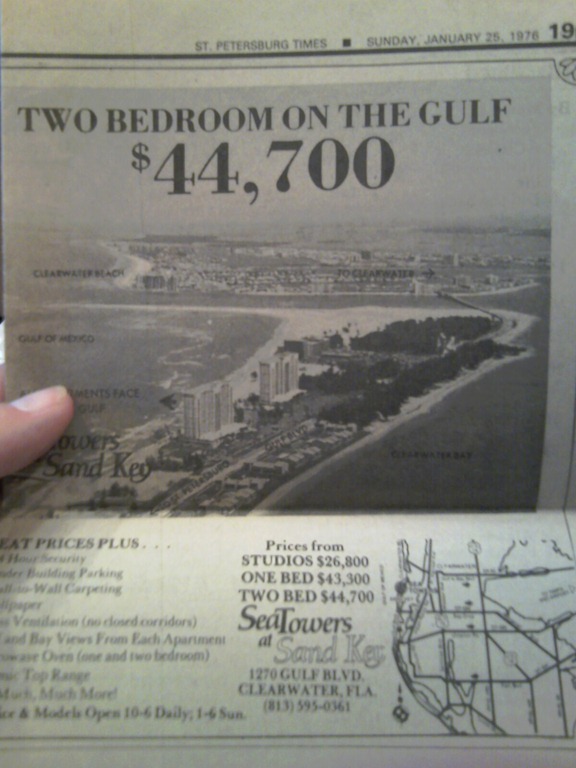 The ad was advertising two bedroom condos for sale on Clearwater Beach for $44,700! WOW! What a deal, I could buy one of those with just a little juggling of my budget. 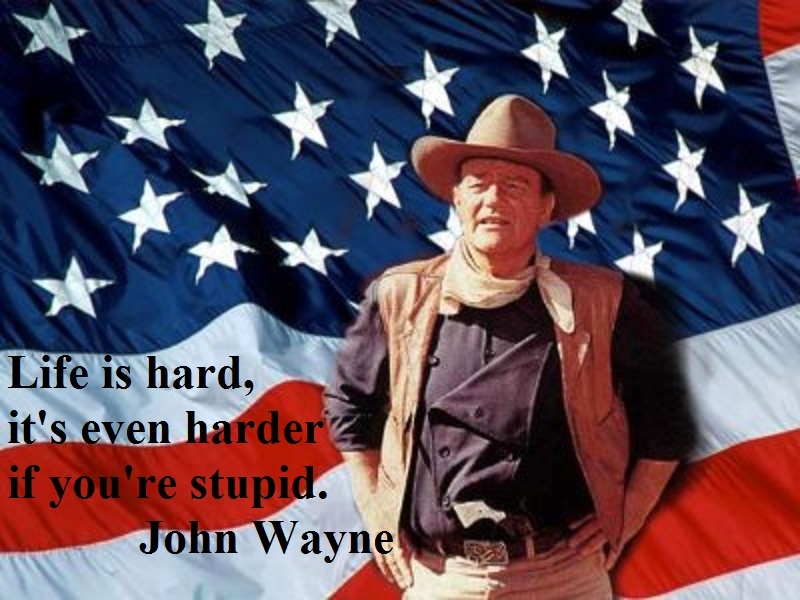 Oh wait, I just looked and the median income in 1976 was $12,000 annually, so that would make it a little tougher. If you had purchased a condo in Florida in 1976, who knows what it would have been worth 30 years later in 2006. Still, it would be nice to be able to predict the future wouldn’t it? I wanted to show you three more of my books. 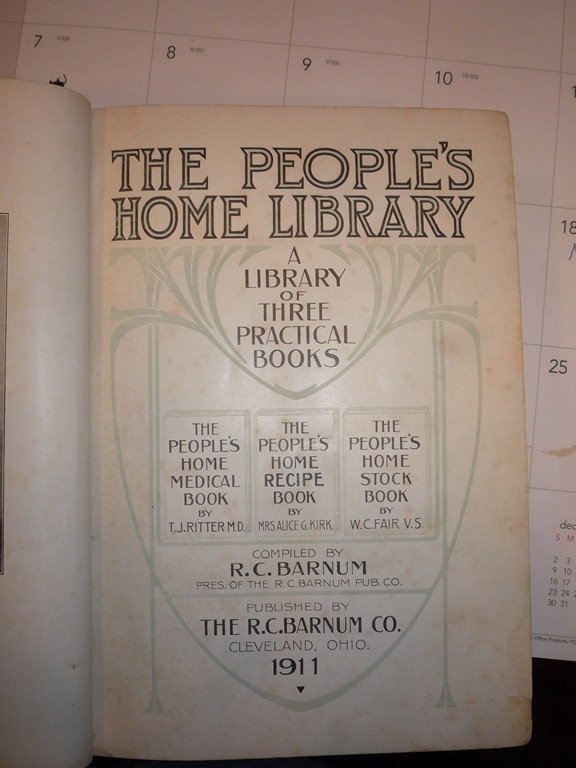 The first one is the People’s Home Library, it is actually three books in one. 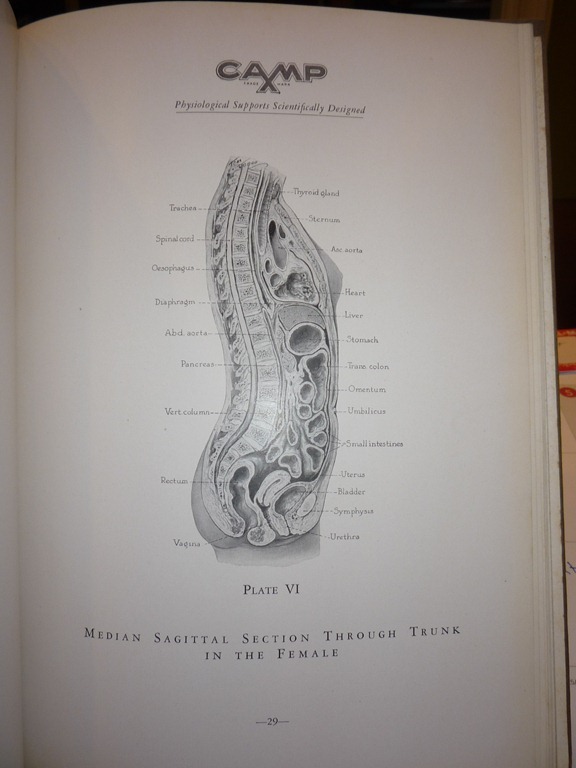 It has a Home Medical Book, a Home Recipe Book, and a Home Livestock Book. As you can see, it was published in 1911 so there is probably some old knowledge in this book that people now-a-days have forgotten. I especially like the Medical Book, when Obamacare is fully implemented, and we are having to wait for several months just to get in to see a doctor it might be a good idea to know how to care for ourselves. 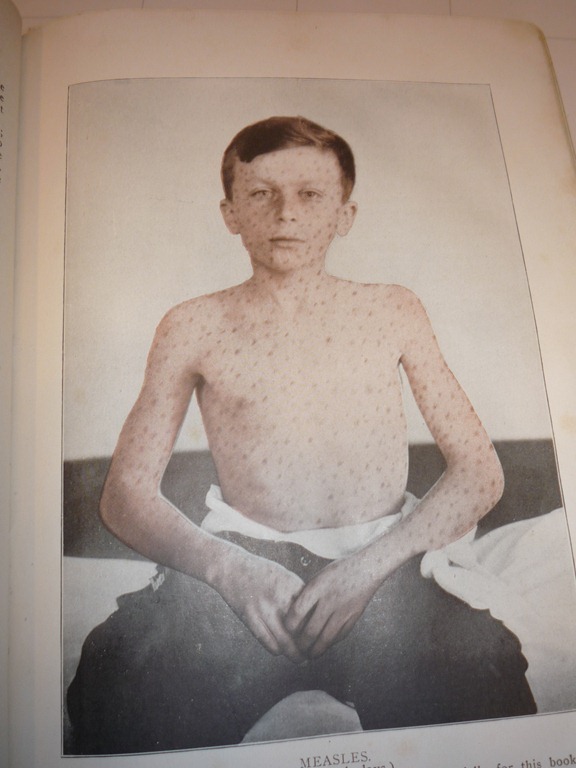 It even has some color photographs showing some common disease symptoms, such as this young man suffering with measles. 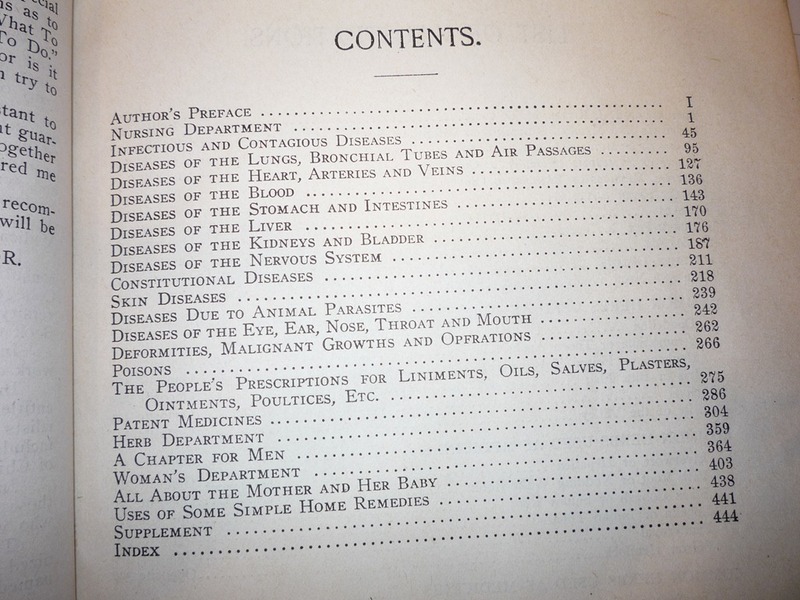 The table of contents shows a chapter on Herbal medicines and a chapter on home prescriptions for liniments, oils, salves,plasters, ointments, and poultices. This might be some good information to have if times get hard. Home remedies might be the only things available to us in the near future, and most of the older generation who might remember some of these things are so old now they can no longer remember clearly how to use these home remedies. 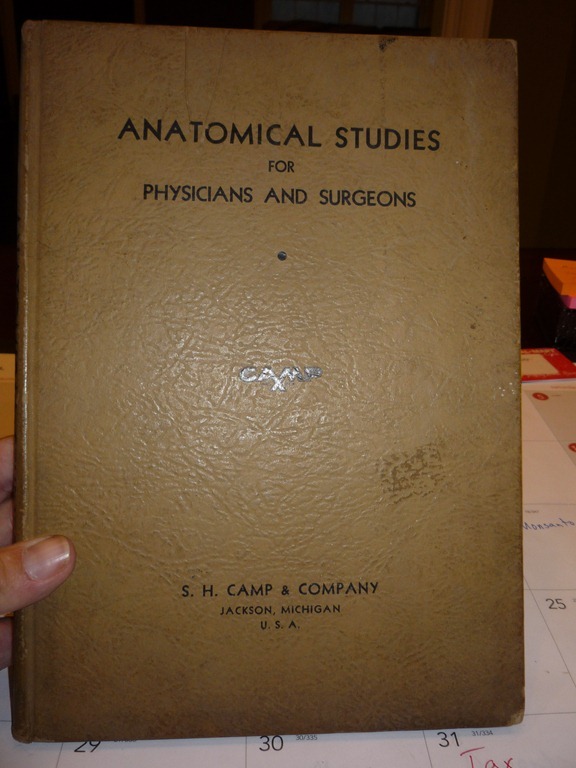 I also have a copy of Anatomical Studies for Physicians and Surgeons published in 1934. I hope it never gets so bad I have to perform any home surgery, but if I do, I have a good book to learn from. 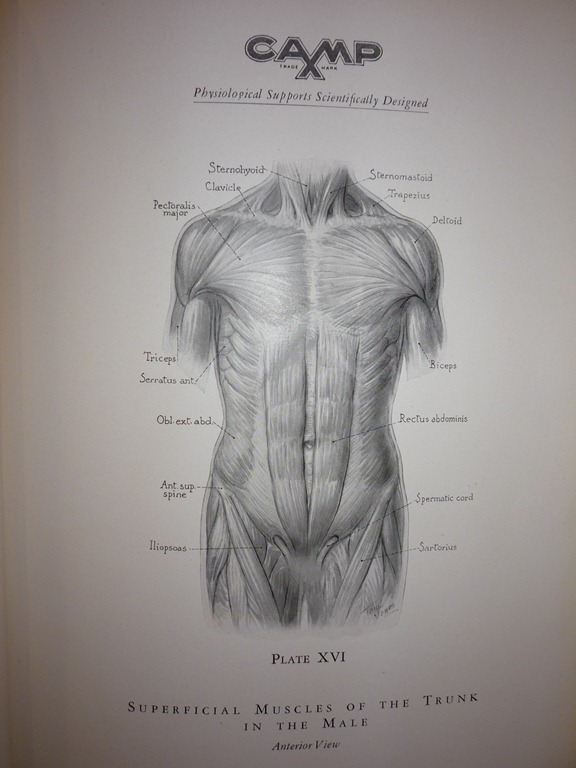 This book has page after page showing the male and female muscles, organs, and skeletal bones. 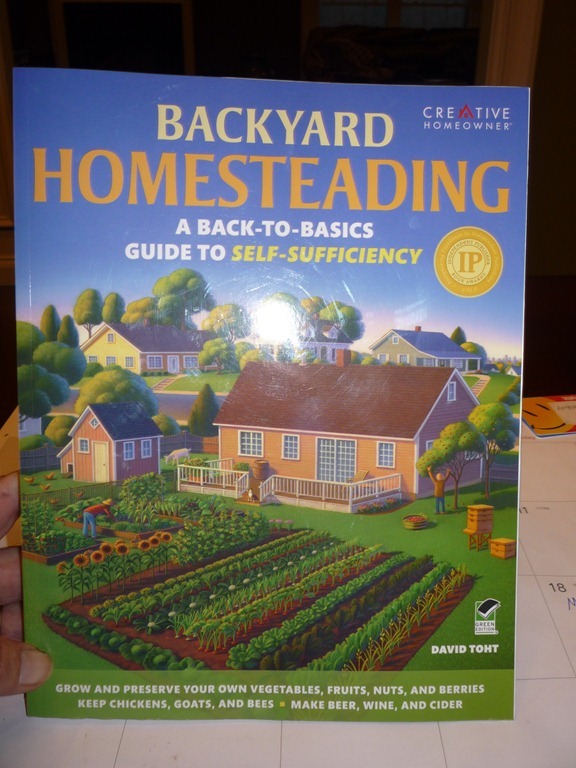 This is a new book I bought today from Lowe’s, there is a lot of good information for homesteaders. All of this information is available on the internet, but are you absolutely sure the internet will always be available exactly when you need it? It is always good to have a hardcopy of important information on hand. 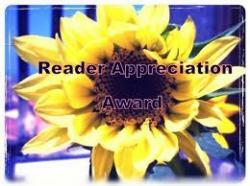 I am working on getting some e-books and PDF’s with important information and storing them on thumb drives. That way they can be accessed without the internet, you will just need a functioning computer. 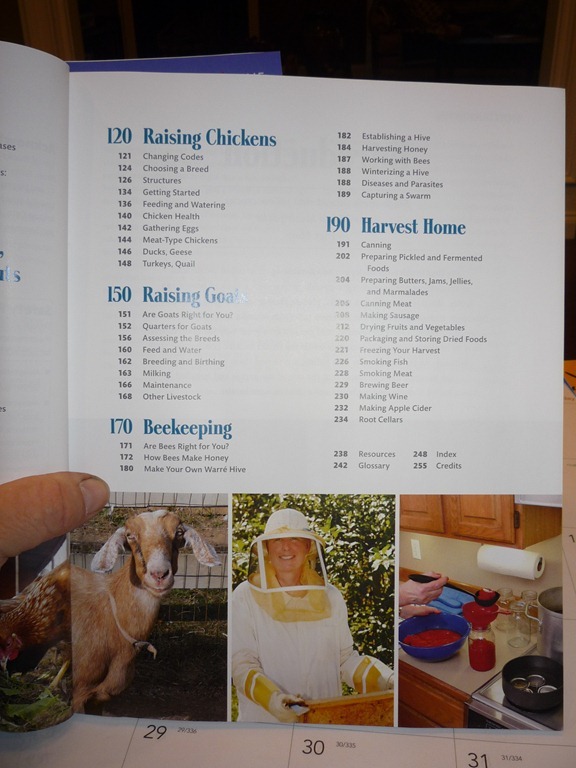 This book has information on raising vegetables, fruit, chickens, goats, and beekeeping, and information on canning, smoking and preserving all this bounty. Do you have your hard times library started? As we were moving our book collection, I was amazed at the amount of great books for hard times that we had acquired over the past 15 years. 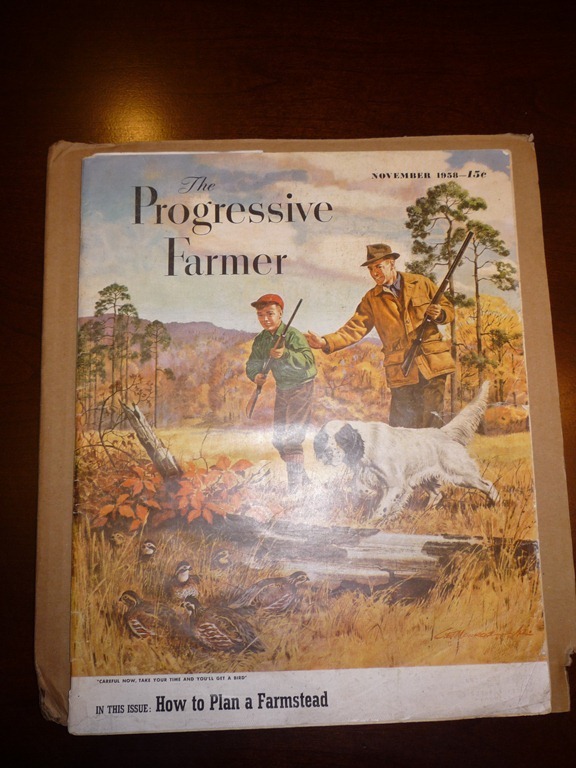 This is one example, a Progressive Farmer magazine from 1958. I paid $3 for this several years ago just because I liked the cover art of the quail hunting scene. But if you look at the bottom of the page, you can see the title of the main theme for this issue. How to plan a farmstead. How appropriate is that for someone like me just starting a new homestead? 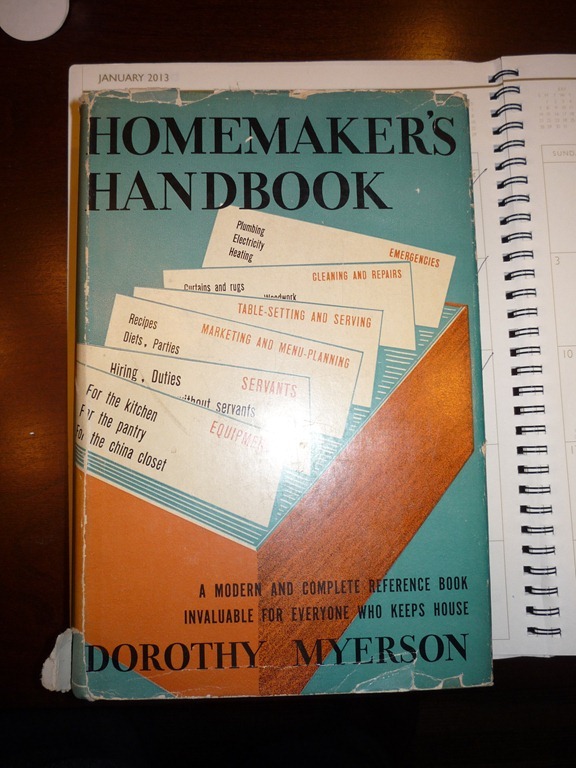 This is one of my favorites, a copy of The Homemakers Handbook, copyright 1935. It goes into great detail with things every woman should know about keeping house. It also includes hints for young brides to do things to please and satisfy her new husband. What an outdated concept! Someone needs to call the Politically Correct Police and get them to ban this book. HAHA! Doing things just to please your husband, does anyone besides my Sweet Thing still have that kind of attitude? I doubt if many young women ( or older women for that matter ) still have that attitude towards their marriage. I am really lucky to have my Sweet Thing, she is definitely one of the good ones! I would like to welcome my newest follower David Dadu. David has a blog full of techie tips for search engine optimization so check it out. Thanks for hitting that follow button!